50% of internet searches will be spoken by 2020. It's a flashy stat but is voice search really changing marketers' strategies in today's landscape? There has been a lot written about voice search but one of the most well thought out points-of-view we have read is Ian Lurie's article, "Beware: Voice Search Isn't That Exciting." - what makes a good candidate for a voice search? - what is not a good candidate for a voice search? - what future version of voice search could disrupt traditional searching? The best we advice we have for marketers is think hard before you implement a 'voice search first' strategy. There are still a lot of queries where a screen is a better place to sort through results then listening to an answer. Nicole and I work here with a great team at shape.io, headquartered in Bend Oregon where we're recording from now. Just some background about us, we left our agency jobs as marketers to build software for digital advertising teams. 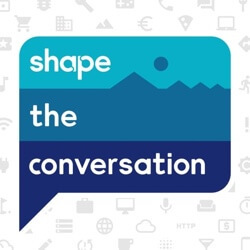 So we'll be talking about working in marketing and growing shape.io on this podcast. Our goal is to just talk about our experiences along the way, some lessons we've learned. We're going to get some guest in the mix on upcoming episodes and hopefully give you some things you can use to shape your own conversations throughout the week. Why should you listen to us at all. We're a software company, profitable software company, and so that's always a good place to start. We're outside of the Silicon Valley bubble. We did raise venture capital in 2015 and have used that to grow the team and gain customers and a lot of experiences along the way. So Nicole in this episode what are we going to be talking about. So we'll be discussing voice search and kind of the implications for advertising and marketing. Yeah this is a big one for us to think about. A lot of our... So our software syncs with the major search engines ad data Google Bing these places where searches are occurring our customers it's a big focus of theirs so we're always thinking about what could upset that industry what could change that. I think in my career we've seen a couple of big shifts. One of those I think is really Facebook coming along and being a big option when I started back in search engine marketing and like '07. Facebook was just kind of trying to get its ad game going and I think voice could be one of those shifts maybe that changes a lot but I'm not sure yet. So I kind of put it on par with the shift that we saw to mobile. So you know when I started in digital advertising it was mostly at least at our agency or it was search focused. 2009. So search focused and then our Google reps and everyone started talking about mobile. I mean there were some display and remarketing as well that was just coming to be really impactful in the market but it was this idea of mobile mobile mobile that to me is a piece of the bigger advertising puzzle. Right. And so was voice you're going to still search on Google or on Bing. But, are you gonna do it mobile are you gonna do it voice. That's how I kind of saw that shift. Yeah I think that's a really good analogy or way to look at it. Because the stat everybody sees now is you know by 2020, 50 percent of searches will be voice. I think that strikes a lot of fear in the search marketers when they initially hear it because that's way different than it is today. You know if you're in an environment where you're writing ads and putting them up against three or four other ads voice search doesn't play as well necessarily in that kind of environment. Well the question for me that I constantly think about is what skills am I going to have to acquire to be able to do a voice search successfully or a voice you know ad successfully? Does that mean that I now have to have a very great radio announcer voice and be able to speak into a mic like I am doing right now much more coherently though in 80 or 125 characters? Am I going to have created ad like that? Or are we going to have to get more production value or are we gonna have to have an entire department that's just devoted to creating these ads similar to what you see with display departments now or you know different video ads because these media are taking up much more effort to create really great solid ads. Yeah. And I think the way you're getting delivered these results right now is a really curated experience you know you're hearing Alexa read everything in Alexa's voice you're hearing Cortana say everything and Cortana is voice and I think it's going to be... there's not too much data or experimentation yet that's gone on in terms of delivering ads to these to voice searches. It's a lot of features snippets it's other it's product type searches but it's not you know as traditional PPC or advertising we might see there's not too much data on that. Now the one ad that I think I've heard of that created a big hullabaloo is that Beauty and the Beast ad on Alexa I believe it was that automatically either triggered before query, I can't quite remember movie time query something like that but just you don't hear a lot about it right now. Yeah. And I think the examples I've seen are more let's say we're asking Alexa to order some kind of commodity off of Amazon. Yeah paper towels okay if you're going to like maybe you could pay to have your paper towel brand be the brand that gets automatically ordered you know is Amazon, I have to imagine has explored maybe they already have, their own brands you know like Costco has Kirkland you know is Amazon going to start to take more of the pie there with their own brands that when you order default or will they allow other competitors like brawny or other tile manufacturers to outbid their own products like where are their margins live? It's going to be really interesting to me to see how Amazon handles that blended ad organic environment the same way that Google has had a handle it on search results. Yeah I think there's a lot of potential for abuse there. I think there's a lot of profit driven potential abuse like you could have an entire results section full of ads. Are we going to have to have the same sponsored disclosure before every ad or is voice search outside of that. Are we going to live in an ad world where we don't actually know that they're ads. Yeah I know that will be really interesting. I think you say you already use echo, right? Alexa in your day to day. If you'd tell it to order something it's pulling off your previous orders. Can you, you know, if you tell it to order something generic does it just go ahead and do it pick a brand for you? So here's the thing. I do not trust my Alexa and it's not because of the capabilities of Alexa it's because I don't trust my... granted, he's 8 months old he can't say anything right now. My infant and potentially a little bit of my husband. My husband's a shopper. Because you have the ability to set a pass code or a deceptive protections from allowing someone to order something but I just I heard this story about a little 4 year old girl that, however old she was, that had a whole conversation with Alexa and ordered this like 400 dollar Dollhouse. So I have not connected my credit card to it. I'm just. I mean this is a case I'm a little bit worried of irresponsible use on our site and I'm also a bit worried about privacy not to lie. I mean that's still something that regardless of whether we're talking about it from an ad or marketing perspective privacy concerns shared or leaked data concerns still I think is on the mind for a lot of voice search users. Yeah and I think a lot of those reasons are why some people aren't necessarily buying all the hype. So example that Ian Lurie he's got a great article he wrote and published on LinkedIn. I'm sure you can find it there. We'll link to it in the show notes. But he starts to pick apart that stat a little bit of 50 percent of search will be voice and what that really means in terms of changing the day-to-day marketers and he makes a lot of great points in his piece. But one of them is that to him a genuine voice search that really disruptive is going to change the way things work is when you have a spoken voice query and you're getting a spoken voice result. The disruption isn't really happening when you have a spoken voice query and that you're looking at a screen and still getting that result. Like I think there is some better user experience potentially could be there you know your work in the kitchen in your hands are tied you need to, you know, activate a Google search on your screen that you can see there's still things there but that doesn't really change any strategies from a marketers perspective you're still getting a screen and that's a lot of the point that Ian is making and is like there's a lot of great searches that voice lends itself better to and there are some that aren't so great. Yeah I think it's that process is cumbersome if you say you know give me a recipe for this and it gives you 10 results and then you have to pick through results with your voice. You may find something isn't like let's say you want make a cheesecake maybe the first 10 aren't the right thing eventually you're going to get frustrated you're just going to go to your iPad, or go to your desktop and find that result. Yeah, I mean, Lurie really kind of talks about these ambiguous queries where voice can't tell you the best way to make toast or it can't tell you the next Netflix series to binge because it doesn't know your behaviors and your likes and dislikes. From that TV show or sorry your Netflix queue now could as we go further into AI and further into all of you know that the intelligent learning about each and every user of different software could those integrate and get there? Maybe. Is it there right now? No. Yeah. And I think there are searches or examples like what's the temperature today? That's a great voice search to make one answer, one result. Ones where you need to see a bunch of results or you need options. You know that is where seeing a screen is still going to be an important part of making that search and doing that search and I think people are getting more comfortable with voice activated kind of experiences and conversations when it's, you know, you're commanding a platform or something to do something with your voice so you know very Tony Stark ish you know. Jarvis do this. OK Google play this playlist from Spotify. Hey Alexa you know play a podcast from a certain podcast catcher app like these commands are still very good and I still think there's some places where we're going to be doing more voice commanding going forward as it gets better. I mean is as Alexa to me already seems like better at understanding my voice as I've played with it over the last few weeks than Siri and I think that's been one of the big sort of places where you've seen now voice search start to gain more traction is that it's a lot better at understanding just what you're saying. If you remember the last episode we went through the Mary Meeker slide deck and they talked about how AI now is just as good as your average human at picking out what somebody is saying or judging that. And that I think has been the tipping point where now you start to see stats like 50 percent of searches and this will be voice. But I mean let's think of some scenarios or companies that you should maybe be on the lookout for more than others if they're your clients or customers. So I think there are some of those companies. Lurie points out as well I believe that local searches voice has to be better for so you know find the closest laundromat to me. Those queries I think we're going to see increased success there. Now when you think about it from an enterprise or a you know a bigger level that's where it gets a little fuzzy for me. There's all sorts of channels that I'm excited about actually voice bringing more to the forefront for marketers to look at. One could be the way Google might use Waze to get in the mix. You know you're interacting with Waze primarily if you're driving you know through voice and that can be a way for them to deliver up results for things that are around your services around you that you're looking for. Well they already do. Are you talking about their advertising platform. Because I don't know if it necessarily automatically starts speaking about the places near you. But I definitely know that if you're on Waze it'll pop up hey there's a McDonald's if they're advertising near you. I guess something in the next version of that you know using that same advertising feed. But instead of just displaying results on the Waze page it's able to deliver those results as a potential one result from your query which is where I think voice searches are really great. Like what's one result maybe two results. So I think people looking at local and kind of those types of searches you need to be paying attention to it may be more than others for us thinking about it. B2B software I don't know. I can't imagine voice truly upsetting to much of our strategies. On the search engine result pages over the next few years. Now and again that's something that Lurie kind of states he says you know you can't base your entire marketing strategy on voice because your search will absolutely suffer without some continued massive shifts and massive focus on B2B by players like Google and even, I mean Amazon doesn't really quite fit in there maybe Cortana, I don't think we have a clear idea where it's going yet. Now that's not to say that they don't come up with some amazing application and we will have to adjust our strategy. I think right now we keep in the back of our minds and we know that eventually it'll shift more there but we can't make any massive strides yet. There are some scenarios there where I think that voice could actually kind of jump a search result page. You know? I think there's some interesting ways that kind of melding together the data it knows about you combined with what you've previously done. You know I think that's something to think about. Yeah. Another thing that I think about, and I hope I'm not disclosing too much right now you can cut me off if I am, is the idea of screenless apps and I couldn't really think of one at first but this is the idea that there are developers developing apps right now where they have obviously no screen and you interact with them completely using your voice that gives you back the results or it gives you back the information that you need. So something that I know you can think of as Siri on your watch. But another thing that we've even talked about developing here is the idea of having a bot or a you know kind of something that we could voice commands using an echo or using something similar that would respond with information for our clients. So they would ask about their advertising performance and it would come back and say Yep here you go that's a perfect rainless app in my mind. Yeah, I think going to be a lot of screenless apps that are backed by actual apps to start. So I think version 1 is going to be, so the example you give like applying it to ours, digital marketer that maybe wants to pull out their advertising spend for yesterday for all their accounts. You know they would still need to sync was Shape to create an account to get that data in there so that we could present it in an Alexa skill out there. Now screenless apps, I think there's so many applications there are so many niche use cases like think of all the screen apps you could have for like marketing coaching. You know give me one tip a day or give me somebody to read in this area. You know you could have really controlled experiences for the screenless apps that could be limited you know but an Alexa skill that just read you the weather or just does one thing I think is a good example of where screenless apps but now how are those developers making money? You know if they kind of have to charge for their app unless when you go to use your screenless app it's like today's use is sponsored by. And that's where they're generating their income. But there's no infrastructure set up for that yet. You know Google that's got to be priority. Who knows what Amazon. Who knows what to kind of figure it out to help developers make more from their ideas. But you're right there's a whole ecosystem of these screenless apps that are probably to be popping up. Well, and kind of conversely to shift against that to the other idea that really interests me about the future is it's actually screen and voice search combined. So you have... my apologies. You have things like I think it's the Amazon Echo spot and the Amazon Echo touch or something similar to that where these are actually voice search devices that have a screen. So now you know kind of circling back to what we were talking about earlier with buying paper towels versus having the voice search be a little bit more understanding of your preferences when you're buying something like a dress. You get to this point where, are we going to be sitting there saying Alexa I want a red dress and it will provide you result. You won't even have to touch the screen so you won't be doing your traditional desktop search and purchase or mobile search and purchase. You'll be seeing that in front of you and it will recommend the top five dresses it thinks you want, and then you complete that purchase. That's another interesting kind of future state for me with voice search where I don't quite know where that's going. And again how that ad infrastructure is going to play into it. You're more in a conversation with their search engine so you can kind of get a feel for this to playing around with Alexa and I actually reached out to a buddy of mine on this idea this week to kind of ask him he runs a VR company that's doing a lot of really cool things about creating VR concerts. So you've got the performer performing wherever but everybody's like zooming into their VR headset on their home phone or in their home like VR set to the concert as they are with everybody else. If you guys haven't watched video of people doing this, do it. It is amazing because I've got giant headphones on and they're just dancing their butts off and it's completely silent. I have actually seen it at weddings. Yeah, that to me weirds me out. I'll have to ask Adam about that one but I went to high school with Adam Arrigo the CEO of The Wave VR so I reached out to him this week to talk to him hey like you're on the forefront of VR you're doing all this cool stuff. Do you ever just like search Google with your VR headset on. Like does anybody browse the internet with their VR headset because this idea you're talking about it being a conversation with your search engine is really interesting to me. I love the idea of saying hey Google show me know five options for green shoes like no, too green. Go a little less green or I changed my mind not green. And like crafting the results of the search engine through voice sync is something I'm really interested in I think could be really cool in a virtual VR environment. If you've got all these options or information in front of you and you're kind of coaching whoever through helping you find the result I think that's a way that you can start to break through that you know a search on the result page is just better you know giving you complicated results. So essentially I think there are some ways that those systems can look within from what they already know about you to deliver results and then you could help coach them through. Like Hey I don't like any results I've seen from this you URL, don't show me those anymore. Yeah I was just going to say it'll start learning and eventually you know unless you're refreshing your cookies or your you know your search or hiding your search preferences from Google it'll learn so much about you that it will be able to get to the point where it can be pretty specific on your preferences right away when you say I want to order new shoes. That to me is a lot of what Google's been doing behind the scenes for you. So I think they've kind of noticed sites you haven't clicked on as much and they start to remove those from the your search results. But I'm interested in a more active future for how training google how to give you even better results. I know there's Web sites I just would wish I'd never see all my search results anymore. You know I think there's lots of cool ideas for crafting Google to be better at giving you what you need or want. Now there's a lot of dangerous things there creating information bubbles for yourself. Not really seeing the full picture of maybe a complicated topic that deserves conversation on both sides of it. But for me I know it's hard for me to believe that searching in 15-20 years is going to look like it does now kind of hunched over a laptop. There's going to be some shift. No, and I think that's really the key takeaway from today's episode is that there will be a shift. It's happening right now already. We're seeing it play out more quickly in B2C or in retail but that ultimately you know we're all going to start having to think about that impact of voice. And I mean who knows the next technology may come and blows voice out of the water in a couple of years. Yeah I think any major trend it's going to affect some industries more than others you need to think carefully about all your clients and where it might affect. I think you've got to dig in to really see if it's going to affect you. I can't see too many stats right now. I've heard too many anecdotal stories from people talking about how this voice search has really upset or changed their strategy on a digital front yet. But I think a combination of VR voice command. I think voice is going to become more a part of our life whether it's commanding an app to do something. I think in 10-15 years any software you use there's going to be some ability for you to control that app with your voice. Yeah I mean we keep going back to the minorities are part of like a voice. Like I'm not even touching a screen but it's in front of me like whooshing things all over the place. I think that is the future of the workplace. You know I honestly think the future of the workplace is almost everybody comes and they've got their own little like 8 by 10 foot room. You lock in and you're like immersed in your Excel sheet. You know you've got things on all your walls. You've got a virtual headset on you're telling it to do stuff with your voice you're not hunched over and typing you know 10-15 years from now. And if you're doing your job with your voice you're going to be searching google and doing things that are voice. Now I think you still might be seeing search results for a long time. Same as Ian Lurie kind of posits in his article but the way people are triggering that search is still a really important thing that we need to think about as a marketer and what it means even for your software going forward as people get more comfortable doing more stuff with their voice and breakthrough some privacy concerns like you have Amazon and Google get even better at it. It'll be interesting to see how many ad dollars start flowing in directions that are highly influenced by voice searches and voice results spoken results. I think let's wrap it up there. What do you say. And go find us on iTunes or wherever you listen to podcasts. Subscribe, tell some friends we're still getting the ball rolling so anything helps and over and out from Bend Oregon.